Lucy lives with her grandmother in a small rural town that could be Anywhere, USA. Tormented by her high school classmates who find out about her troubled past and her mother’s drug addiction, she is a lonely outsider who spends her time wandering the forest that lies just outside of town. When she develops a crush on Jenny, a glamorous new student, Lucy experiences strange visions, grows physically stronger and her senses sharpen- just as mysteriously savaged deer carcasses begin appearing in the woods. 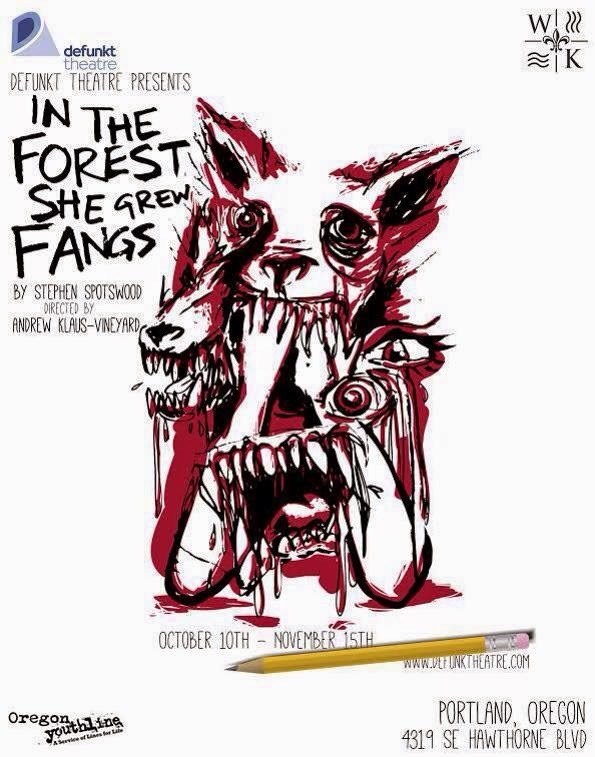 Using the archetypical story of Little Red Riding Hood as a backdrop for a timely exploration of teen bullying In the Forest, She Grew Fangs is a riveting evening of theater; the Washington Post describes it as “part timeless adolescent psychodrama, part harsh truths about growing up in our texting-and-social-media era, and part bloodshot fairy tale.” Defunkt's production is a west coast premiere and is featured in the October 2014 issue of American Theater Magazine. In The Forest, She Grew Fangs contains strong language and intense themes, it is recommended for mature high school students and older. Parental Discretion is advised. Defunkt's 15th Anniversary Season: Out of the Wild is made possible in part through the support of Ronni Lacroute/Willakenzie Estate ,The Portland Civic Guild, Bucks For Buildings, Ellyn Bye and The James F and Marion L Miller Foundation.